Whether it’s newly built or more than 100 years old, you want to feel comfortable in your home. As the seasons change, are you bothered by high heating or cooling bills, damp musty smells or drafty windows? 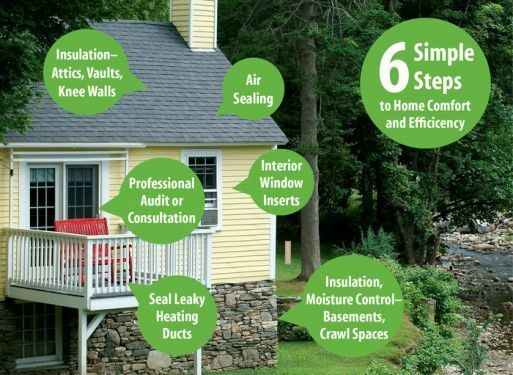 Making your home more comfortable, in any season, can be as easy as following the advice in these six simple steps. When you think of fixing drafty windows, often the go-to move is to replace the entire window. That’s an expensive option. Alternatively, Indow Windows may be a better, less costly option. These custom made interior acrylic panels work in conjunction with your existing windows to prevent heat loss and reduce drafts. Fitted with a silicone compression gasket, these durable interior storm windows are easy to install and remove seasonally. The warmer weather of spring often signals the beginning of home improvement season for many home owners. Whether the jobs are big, small, indoors or outdoors, the rejuvenation of springtime can provide great inspiration for rejuvenating your home. As the home building and remodeling industry celebrates National Home Remodeling Month in May, more home owners are making their dream homes become a reality by hiring a remodeling professional. Some of the most impactful projects that can transform an existing home include open-floor plan concepts, aging-in-place designs and energy-efficient modifications. Open floor plans continue to gain in popularity, as home owners are increasingly seek to make areas of their home feel more spacious and connected. Choosing to remove an interior wall or two can quickly breathe new life into an entire floor as more natural light fills the area, and friends and family can more easily interact with each other. Entertaining becomes easier and more enjoyable as larger groups can gather and move about freely in the space. Enhancing to your home to better accommodate your mobility needs as you get older can also be an upgrade in style and comfort for others in your household. For example, a bathroom upgrade where luxury meets universal design might include a large walk-in shower with zero-threshold, a built-in teak bench or tile corner seat and multiple showerheads. And a new kitchen island may add an eye-catching look and adaptive conveniences with multi-level countertops, a deep drawer for dishes, a built-in microwave and a sink with a hands-free faucet. Remodeling your home doesn’t just fulfill your family’s dream of living in a more comfortable and stylish home. It can also lead to significant savings on utility costs while improving air quality for better health and strengthening the long-term value of your home. Some of the top upgrades that can make a home more energy efficient include installing high-efficiency windows and low-flow water fixtures, replacing dated appliances and older HVAC systems with ENERGY STAR®-rated models, and increasing or upgrading the quality of insulation.